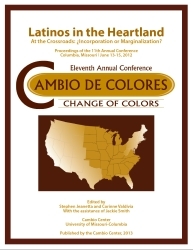 This is an archival site for the Twelfth Cambio de colores conference (2013). Document with biographical sketches for all 55 conference presenters (PDF). Book of Proceedings of the 2012 conference (142 pp) will be given free to all registered participants. Click on the cover at right to see the table of contents. Conference Program, now with all plenary session speakers: the latest immigration reform update from Washington D.C..; immigrant Latinas working on integration in the Heartland; health policy and health practice in one session; Latinos as part and parcel of the Midwest; the family's role in children's lives and education; and a guest lunch lecture from the Federal Reserve Bank about Latinos and the financial crisis. Copyright © 2013 – Curators of the University of Missouri. All rights reserved. DMCA and other copyright information.